We’re celebrating Summer Restaurant Week here at Butcher Block Co. with John Boos commercial grade products. Whether you have a bakery, deli, cafe, or large restaurant, you can trust in John Boos NSF-approved equipment. We offer a variety of John Boos commercial grade products designed to stand up to the wear and tear of restaurant kitchens, all while helping you work efficiently, run smoothly, and look good doing it! 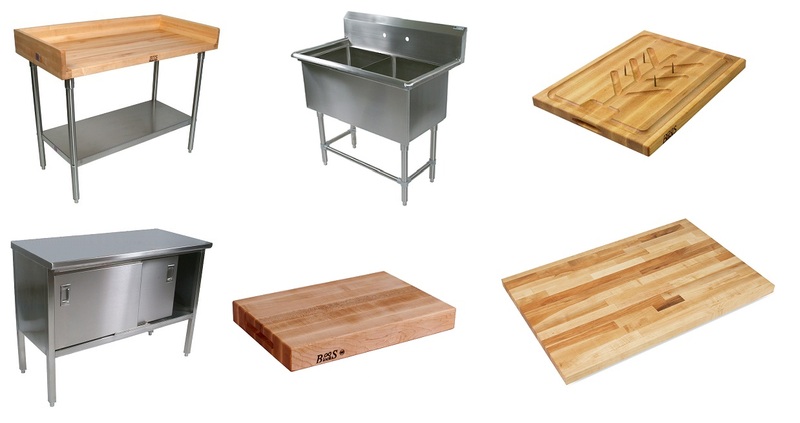 If you are looking to upgrade your restaurant or other food service kitchen, check out our John Boos commercial grade products for the highest in quality. For “back of house” products, we offer prep tables available in wood, stainless steel, or poly tops; stainless steel sinks with up to four basins, with and without drain boards; stainless steel cabinets with optional doors and/or drawers, in both maple and stainless tops; custom and standard size commercial grade butcher block countertops in hard rock maple; and a variety of NSF-approved cutting boards and chopping blocks. John Boos commercial grade products are top of the line — that’s why you see them in restaurant kitchens across the country, and on nearly every cooking show on TV. If you’re looking to jazz up the “front of house,” Boos has you covered with restaurant quality dining table tops and bases. Available in maple, red oak, cherry, or walnut, there are a variety of standard sizes from which to choose. If you need something outside the standard parameters, contact us to get a quote for custom sizes and shapes. Traditional black metal bases are sold separately and come in both dining and bar height, and in disc, cross, or T style. If you really want to make a statement, consider a custom bar top. A gorgeous butcher block top spanning the length of your bar makes a huge visual impact and is sure to impress your patrons. Butcher block is both durable and beautiful, and will bring warmth and class to your dining room. If you are a restaurateur, be sure to consider our business financing for commercial food service equipment. It is as simple as a click of a button with this 30 second online application. Now it can be easy to purchase your John Boos commercial products.